Coral bleaching 2010, Maniyafushi, 0ver 50% corals bleached but recovered causing little mortality. In a new United Nations’ Intergovernmental Panel on Climate Change (IPCC) report titled, the “Working Group II Contribution to the Fifth Assessment Report” released on 24 March 2014, like its past reports, scientists predict apocalyptic consequences unless the world changes course immediately and dramatically, the fundamental systems that support human civilization are at risk. The effects of warming on the Maldives further push it into uncharted waters. Maldives is a coral atoll based nation and coral ecosystem adds significantly to the national economy. Maldives tourism heavily depends on the goods and services the reefs provide in addition to the coastal protection they provide. Global temperature has increased over the past 50 years. This observed increase is primarily due to human-induced emissions of heat-trapping gases. The United Nations Intergovernmental Panel on Climate Change (IPCC) has recently projected the rise of the sea level worldwide by two feet by 2100 as a result of melting ice sheets and the expanding of the sea by warming seawater. 2010, Maniyafushi, partially dead coral. Temperature increase human induced coral bleaching. 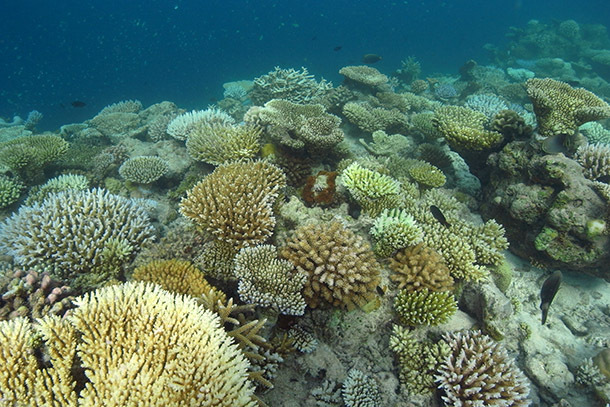 Warming of the sea and changes to the weather pattern has been associated with coral bleaching leading to wide spread damage to coral reefs at a global scale. Coral bleaching is caused when rising water temperatures stress the coral, forcing the coral to expel the algae it uses to obtain food and other nutrients. 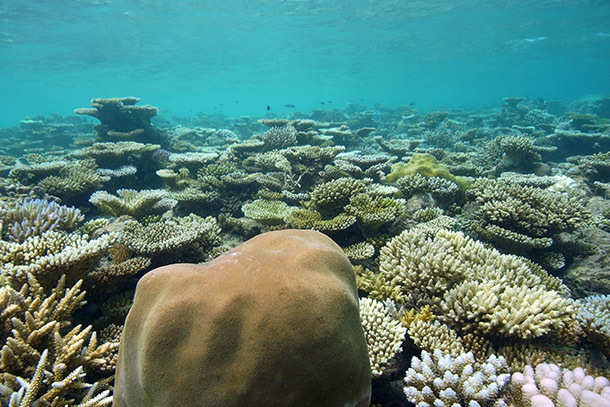 When water temperatures rise even slightly (1-2 Degrees Celsius), algae leave the coral polyp causing the coral to lose its colour and eventually die due to insufficient food source. Coral bleaching in 1998 in Maldives, severely beached 90% of hard corals in shallow waters. Bleaching was also recorded at depths in access of down to 30m. Post bleaching survey of the reefs at several location throughout the atolls across the country by Marine Research Centre showed a little over 2% on in 2004 shows recovery of 2 to 29% live coral, but the recovery extremely varies between the sites. Southern atolls showed faster recovery whereas the central and northern atoll showed slower recovery indicating regional differences in terms of reef recovery. Bandos house reef, 2010 bleaching. A good recovery at one of the monitoring sites by MRC as part of long term monitoring of reefs initiated in 1998. 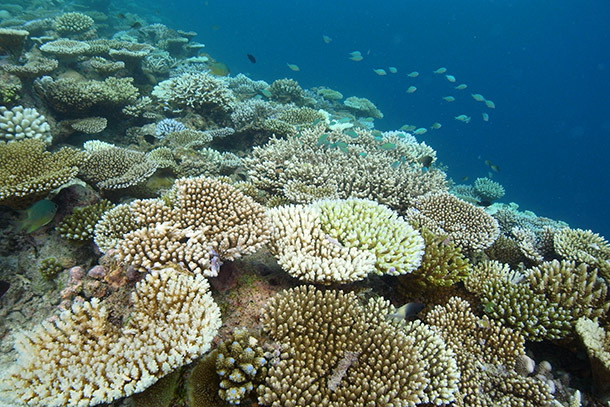 The impact of 2010 bleaching was not significant since 90%of bleached corals recovered. With IPCC predictions in increase in frequency of bleaching at global level, Maldives also witnessed coral bleaching event again in June 2010, similar to coral bleaching since of 1998 bleaching event. However, damage to the reefs due to bleaching of 2010 was far less that of 1998. 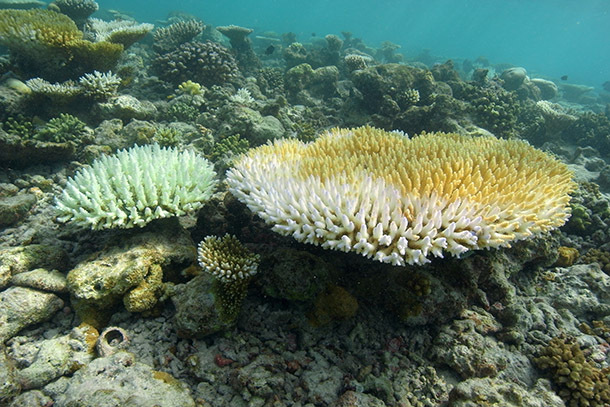 Previous exposure to severe condition of bleaching may have resulted in conditioning the coral to recurrent exposure. This perceived increase in resilience is seen a positive indicator that the reefs can buffer extreme environmental pressure. With little sign of reducing climate related pressure it is important to reduce and manage human induced pressures on these important ecosystems. Adaptation to climate change by changing the attitudes society to use natural resources at ecosystem level has always been important. The goods and services provided by the coral reefs and the pressures on these services are now been understood in the context of their capacity to natural and human pressures at ecosystem level. Therefore, ecosystem-based adaptation to climate change is vital to Maldives to ensure these ecosystems are maintained to ensure inter generational equity. Conserving terrestrial, freshwater and marine ecosystems and restoring degraded ecosystems should be vital for the overall goals of National Climate Change Adaption Plan for the Maldives. The atoll island ecosystems play a crucial role in providing number of ecosystem goods and services that are necessary for well-being of the people and the very survival of the islands in adapting to climate change. Huraa Mangrove. Protected but surrounding development of various infrastructures are encroaching causing concerns. Coral reefs act as first line of defence against wave action and storm surges and reduce coastal erosion. Shallow Lagoon and sea grass beds of island in between the reef and beach act as second line of defence. The coastal vegetation (Heylhi) with salt tolerant plants act as third line of defence. Mangroves play vital role in protecting the atoll islands from coastal erosion by the waves, stop erosion and protect the islands. Even though atoll ecosystems provide a wide range ecosystem based services, the degradation of many ecosystems due to the local human activities are drastically reducing the capacity to protect the islands, livelihood and loss of biodiversity. The poor waste management and disposal via dumping untreated waste near coastal shores hamper coral growth and damage coral reefs. Untreated sewage into coastal areas creates potential problems such nutrient enrichment, algal blooms and eutrophication. Such situations badly upset coral reef. It is imperative to protect the coral reefs, sea grass, coastal vegetation and wetlands to mitigate the adverse impacts of climate change. 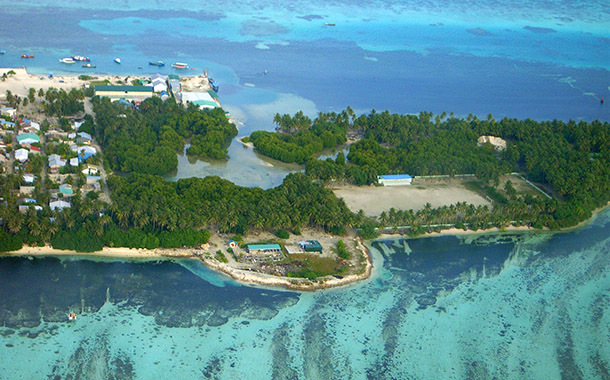 Conserving island terrestrial, freshwater and marine island ecosystems and restoring degraded ecosystems should be vital for the overall goals of National Climate Change Adaption Plan for the Maldives. Common Moorhen (Gallinula chloropus) is a freshwater bird locally known as Valikukulhu or Olhuvalu Kanbili , a duck-like bird in the Rallidae family is found almost exclusively within fresh water wetlands around well-vegetated marshes and ponds in Fuvahmulak. Common Moorhen is basically confined to Fuvahmulak, the atoll island inhabited in the South nearest to the equator in the Maldives. Elsewhere in the world, the Common Moorhen is commonly found rail species. Common Moorhen has a yellow tipped red bill; their legs are greenish and unwebbed feet, with orange or red bands on the lower part. Adults have white stripes on the flanks and have a white rump divided by a black band. Croaks and squawks make up their voice. Common Moorhen primarily feeds on worms, vegetable matter, snail, small fish and aquatic insects. Common Moorhen both male and female birds help to build the nest of floating vegetation. Nests of the Moorhen are built on the water or very close by. The male carries the materials and the female arranges them. Nests are also stages for courtship, and it is ritualized and courtship chasing also associated with pair formation. The Common Moorhen usually lay from five to eleven eggs that are greenish white with spots. However some study shows that the Common Moorhen lays three to four eggs in the tropics. 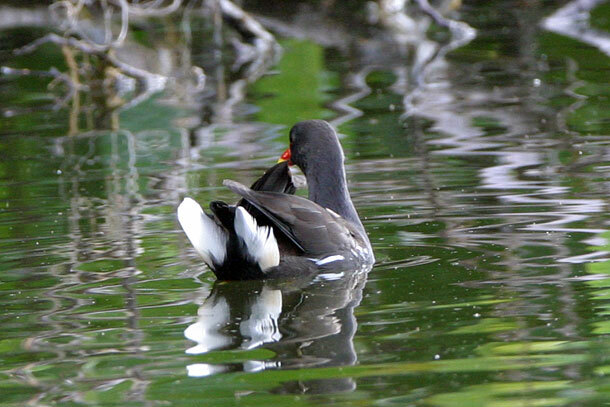 Though no research has been done local people assume that Common Moorhen in Faumulak lays three eggs. In a Common Moorhen nest, more than three eggs can be seen, but sometime wetland bird White-breasted Waterhen (Amaurornis phoenicurus) locally know as Kanbli also lays eggs in the nest of Common Moorhen. It takes between 20 to 21 days for the eggs to hatch. The young take 32 days or two months to fledge. The Common Moorhen nest has a wide shallow cup in the center for the eggs, may be partly floating. Adults eat the eggshells after the chicks hatch. They feed the chicks soon after hatching, mostly insects and their larvae. Moorhens are incredibly intelligent – this Moorhen has built its nest on the water with polythene like cover of a Magnum Ice Cream, most probably to stop water soaking the nest. Immature birds have white necks with a white streak on the side and they have brownish coloured body. They bird have brownish legs. 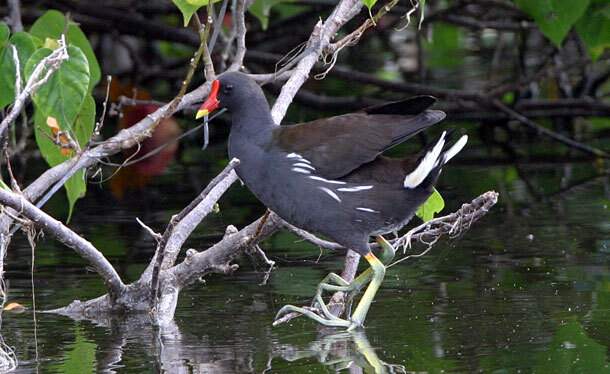 It is widely believed that the freshwater wetland around well-vegetated marshes in Fuvahmulak has led to the successful flourishing of Common Moorhen for more than a century. Common Moorhen is a protected bird in the Maldives; hence, their capture, sale and captivity have been prohibited. 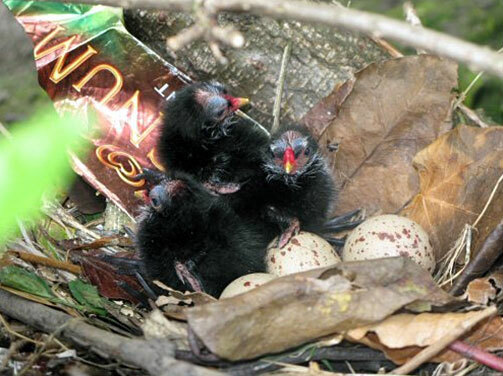 However, there are no vital conservation measures taken to protect the nesting habitats of Common Moorhen. In order to flourish the Common Moorhen, the exclusive bird of Fuvahmulak, it is vital to protect the habitat of this beautiful and interesting bird and control pests such as rats and cats. Ash, J.S. and Shafeeg, Ali (1994) Birds of the Maldive Islands, Indian Ocean, Forktail 10; 3-34. Rasheed, K. (1999) Maldives protected 22 species of birds. Haveeru (Daily newspaper in Dhivehi).